A file photo of Russia’s robotic Progress 55 cargo ship leaving the International Space Station in July 2014. The Progress 59 freighter burned up in Earth’s atmosphere on May 7, 2015, nine days after suffering a serious malfunction shortly after launch. A robotic Russian cargo vessel has died a fiery death in Earth's atmosphere, nine days after launching on a failed mission to the International Space Station. 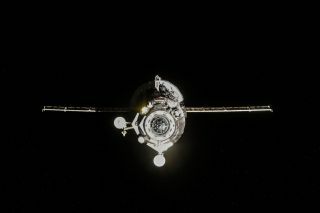 The unmanned Progress 59 freighter burned up at 10:04 p.m. EDT Thursday (May 7; 0204 GMT May 8) over the central Pacific Ocean, officials with the Russian space agency, known as Roscosmos, said in a statement. Progress 59 blasted off April 28 atop a Russian Soyuz rocket. The freighter was packed with more than 5,200 pounds (2,359 kilograms) of cargo, including 3,075 pounds (1,395 kg) of dry cargo, 1,089 pounds (494 kg) of propellant, 925 pounds (420 kg) of water and 110 pounds (50 kg) of compressed gases, according to Russian spaceflight company OAO RSC Energia. But shortly after launch, the cargo craft experienced technical woes and went into a tumble, perhaps as a result of a problem with the Soyuz booster's third stage. Russian ground controllers were not able to command the Progress due to its spin rate. Following a number of failed attempts to regain control of Progress 59, Roscosmos acknowledged that the supply ship was a loss, and that it would fall back to Earth in the near future. Despite Progress 59's impending re-entry, Russia did not request the involvement of the Inter-Agency Space Debris Coordination Committee (IADC), said Holger Krag, head of the European Space Agency's Space Debris Office at the European Space Operations Center in Darmstadt, Germany. The primary purposes of the IADC are to exchange information on space junk research activities between member space agencies, to facilitate opportunities for cooperation in space debris research, to review the progress of ongoing cooperative activities and to identify debris mitigation options. Roscosmos is a member of the IADC. Krag told Space.com before Progress 59's fall that some pieces of the spacecraft would likely make it through Earth's atmosphere and reach the surface. Still, there was an exceedingly small chance, he said, that a person would be injured by the spacecraft's debris. According to space scientist Duncan Steel, who has been keeping an eye on the whereabouts and downfall of Progress 59 from New Zealand, trying to forecast these re-entry events isn't easy. "I think that predicting these things is like the scene in a movie where a canoe is being carried slowly but surely towards the edge of the Niagara Falls," Steel told Space.com. "Everyone knows precisely what is going to happen, but no one is sure when. As the canoe gets closer, it speeds up a little, but you're still not sure when it will reach the edge. Then when it does reach the edge, it's all over really quickly… and it ain't pretty." Steel said that there is simply no way to make an accurate prediction of a re-entry until the last part of the spacecraft's orbit. "But that would require either a vast network of ground-based radars, or precise positions being telemetered down by the spacecraft," Steel said. "The problem is that the upper atmosphere swells and shrinks daily in response to sunlight and many vagaries, in particular solar outbursts of ultraviolet and X-rays." Ezequiel Bellocchio and Jose Fabro captured (and posted on Facebook) this image of the Russian cargo spacecraft Progress 59 passing over Buenos Aires on May 7, 2015. Progress 59's death dive is already being viewed as a teachable moment in some circles. The European Space Agency's Krag, for example, said that all large spacecraft might soon be outfitted with small mirrors called retro-reflectors, to aid in re-entry predictions should something go wrong with their mission. This idea would make use of laser pulses broadcast from Earth to a troubled spacecraft, then reflected back to their point of origin. "It would help people track a spacecraft — those that no longer respond to ground control," Krag said. "It's an interesting option," he said, adding that retro-reflectors would provide precise measurements of the tumbling motion of a spacecraft. Leonard David has been reporting on the space industry for more than five decades. He is former director of research for the National Commission on Space and is co-author of Buzz Aldrin's 2013 book "Mission to Mars – My Vision for Space Exploration" published by National Geographic with a new updated paperback version released this month. Follow us @Spacedotcom, Facebook or Google+. Originally published on Space.com.